I do apologize for the few days of hiatus. I’ve been back in Bintulu for my cousin’s wedding. The trip itself was ok, although I did get a bad case of hayfever due to the renovations going on at my house. Main thing is I’ve spent a few days relaxing with family and enjoyed the change of environment. After a week of indulging in various hometown delights (mostly full of carbs, and err… pork but I was still keeping up with the green intake), it’s good to be back to the kitchen again. I was craving for something relatively simple, so decided to put two vegetables together to make a Quiche. A crustless one too which looks to me more like a ‘cake’. Delicious all the same. Of course, nothing will go wrong when you put egg, cheese and bacon together. I guess I don’t have to mention again how much I like zucchini, judging from the amount of appearances on this blog. I also found a head of broccoli in the fridge saying hello to me. So in it went. Fancy a slice of this? 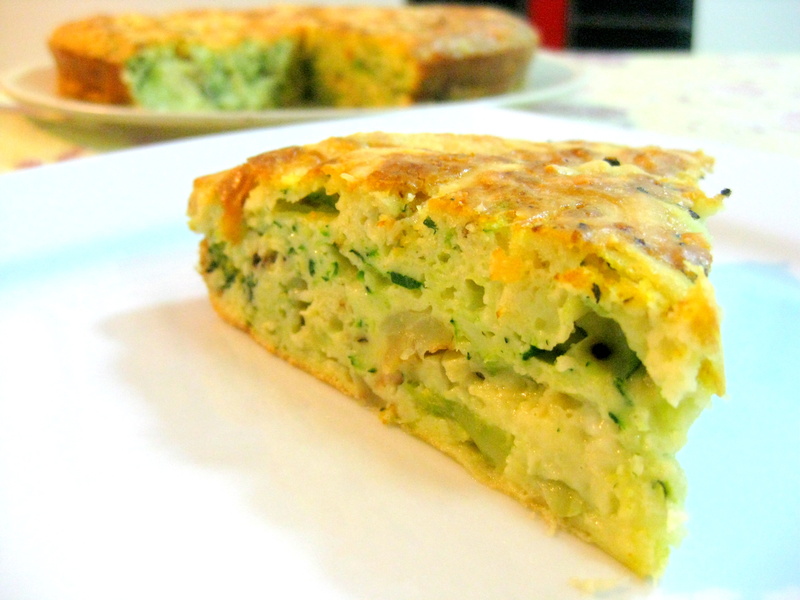 Zucchini and Broccoli ‘Cake’ (Slice). Preheat oven to 175 degree , prepare a round cake tin, or a square casserole dish. Heat the butter in pan and cook the onions and bacon for a few minutes. You can omit this step but I prefer my onions more cooked. Beat the eggs in a large bowl with milk until combined. Add the flour and beat until smooth, then add zucchini, broccoli, onion, bacon, cheese and oil and stir to combine. Season. Pour into the prepared pan and bake in oven for 30 minutes or until cooked through. Rest for about 15 minutes, then cut and serve. By the way, real men eat Quiche too. Bacon makes it taste better anyway! I only used 2, you could use more! Gorgeous. It finished too fast. Really liked this. That was like lovely comfort food while getting in some broccoli and zucchini 🙂 Though it didn’t rise as well like a Quiche, it was cooked well and I still loved the really soft and mushy texture. Thanks!